In this day and age of extraordinary technological advances, it is almost baffling that we still have to nurse our batteries on our favorite devices through the day. We’ve all been there, desperately trying to rummage through the power saving options so as to eke out a few more precious moments so that we can stay connected to the outside world. What we will attempt to do for you in this best portable solar charger article is to provide you with a few suggestions for a back-up source of power so that if you are ever out on your favorite shindig, be it a picnic, hike or a camping trip, you will always be able to recharge your battery to a sufficient level. The portable solar charger made by Anker has become one of the best-selling devices in its field and it’s not hard to see why. It incorporates Anker’s own PowerIQ technology which in basic terms means that it will automatically recognize your cell/laptop/tablet’s original charging protocol so that it can deliver the most suitable and therefore fastest charge possible. This results in 2.4amps per port or 3 amps overall. What makes the Anker PowerPort the best portable solar charger in my eyes is its performance in conditions that are normally deemed less than suitable for other devices. Whereas often you will find other units shut down when there are clouds or there are gloomy conditions, the Anker PowerPort delivers a stable and consistent charge which means you can effectively and confidently plan your day without having to worry about whether you have a full charge. Other positives which makes this such a great portable solar charger is that it is super compact and lightweight. When folded it measures 11.1in x 6.3in meaning it will easily fit in a backpack or picnic basket without hogging any much-needed room. The weight is just under 15oz which is around standard weight for these particular designs but also affords itself to portability. 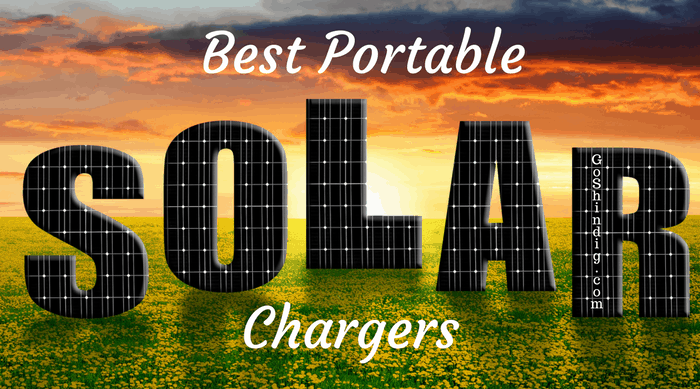 As with most good solar chargers these days, there are eye holes in the corners so that attaching it to your backpack, a tree or a tent offers a secure, stable way of achieving your charge. The Anker PowerPort solar charger comes with 2 ports which will charge separate devices simultaneously. It also comes with a 3ft micro USB cable and an awesome 18 month warranty. Plochy have made an absolute behemoth with their 24000mAh solar charger which also doubles up as a solar power bank. Pound for pound, that is an awful lot of capacity that you get for the size of the device. To put it into perspective, and as stated on their product description on Amazon, this is enough stored power for charging an iPhone 10 times, a Samsung Galaxy 6 times and an iPad Pro 2.2 times. This is why I would advocate the Plochy as being one of the best portable solar panels for camping you could get. There are cheaper solar chargers available and they might be the perfect solution for 1 day emergency situations such as a picnic or a one day festival, but for roughly 40 bucks it makes a lot of sense to have this solar power bank in your arsenal. The Plochy portable solar power bank has 3 USB ports for charging your device and cleverly, has 2 input ports which supports a lightning cable from Apple products and an Android micro port. With these you are able to recharge the solar power charger which will take between 10 and 12 hours. It is also waterproof and dustproof making it ideal for your longer trips where conditions will tend to be more variable over the course of a few days. Compared to the Plochy, this is obviously a Solar power bank that has a lot less capacity. However, I would argue that the Dizual Portable solar power bank is the ideal solar charger that you can carry around with you for everyday emergencies. It is the perfect portable solar cellphone charger for many reasons. The first, and most obvious being its size and weight. This is just 4oz in weight and measures in at just under 6 inches. This makes it a truly pocket or purse charger that will be completely unobtrusive. Despite the 5000mAh capacity, you will still be able to get a full charge into most phones in about 2 hours. So even in emergency situations you will be able to get enough juice to be able to do what you need to in around 10 minutes. 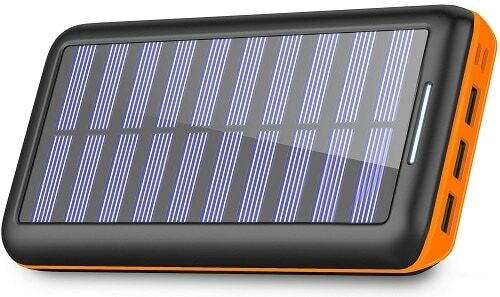 Fully charging this portable solar power bank takes around 6 or 7 hours from an AC source. As seen already, a solar cellphone charger can take about 2 hours to deliver a full charge yet this is considered a fairly quick time to most of us. Imagine, though, needing a full charge for a laptop. To achieve this in a realistic timeframe, we have to search out solar chargers with higher power outputs. 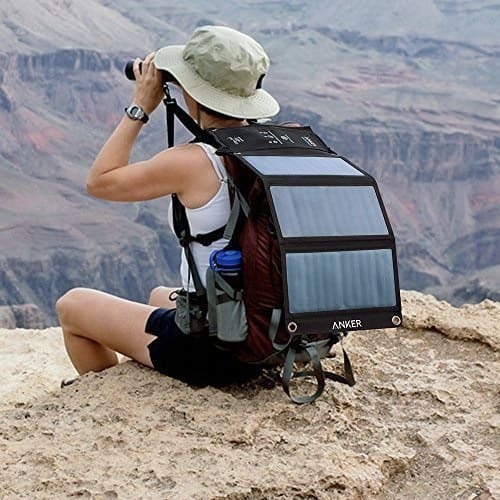 The Allpowers foldable solar panel is not as portable as some other options on this page – it doesn’t possess the ability to live in a backpack or purse – but it does fold up nicely into a briefcase shape which is easily carried. Like all other solar chargers there are 2 USB ports, each capable of 2.4A output but where the Allpower differs from most is that it has a DC port that charges laptops below 21 volts and 12 volts for car batteries. Included are 10 laptop adapters that cover almost all laptops but be sure to check your own compatibility before buying. The Teryei solar charger / solar power bank is a 15000mAh unit encased in a waterproof, shockproof, dustproof, silicone rubber body. The LED flashlight comes with 4 modes and makes it a good tool for hiking/survival purposes. This portable solar panel by RAVPower is a nice alternative to the Anker that we made best portable solar charger. It folds out to reveal 3 panels that are able to produce 16W of power. There’s no internal battery pack but if you need a quick charge of a device this solar charger will do a job for you. The Nektek portable solar charger is another 3 panel variant which is a very good option. As you may have gathered, there are a lot of solar chargers that offer mostly the same things so choosing which one to buy will always come down to personal preference. The Nektek does seem to finish highly in other reviews which might give clues to its effectiveness. Size and Weight: Portable solar chargers are extremely handy pieces of equipment but purchasing one that will ultimately prove impractical due to being too bulky and heavy for certain tasks will leave you feeling dissatisfied. Knowing exactly what your charger is needed for will lead you to more informed decisions when the time comes to buy. Power Options: There are several ways to charge your devices. Chargers can come with or without internal batteries – effectively making them power banks or not. 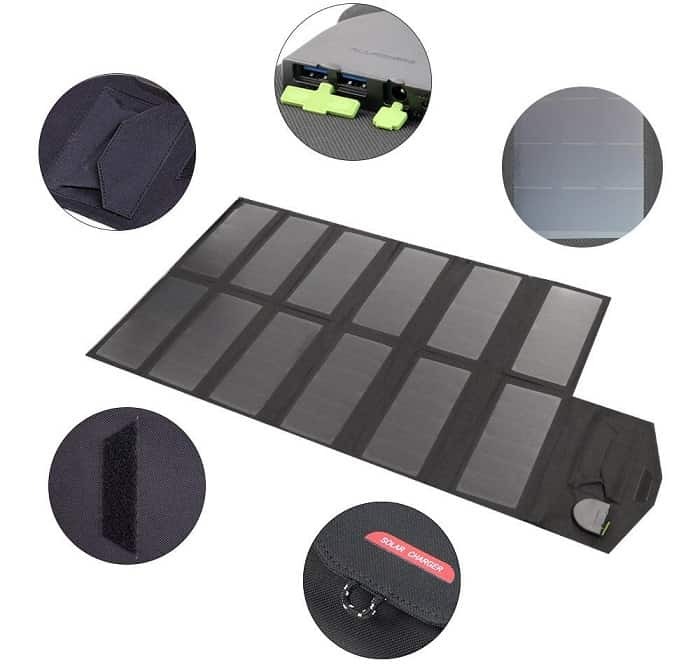 If you only need to top up your cellphone or tablet and you live where there are traditionally clear skies, you can definitely get by with the foldable solar charging panels. If your climate tends to be a bit more changeable however, it might be wiser to invest in a solar power bank charger. Ports and Connections: We are becoming more and more technologically reliant. With this comes a multitude of ways that our devices connect. Making sure your device is compatible with your portable solar charger is imperative. Although the vast majority will get by with USB connections, there are always new patents coming out by companies like Apple which will see brand new designs coming to the market. Durability: If you are an adventure seeker and require a portable solar charger to accompany you, it will be necessary to make sure it can stand up to the rigors of your lifestyle. There are many waterproof solar chargers now as shockprooft and shock proof ones which offer differing layers of security for your device. Do some research and make sure you have the right level of protection for your particular circumstances.